Chesnee is a small town in Spartanburg county SC of less than 1,000 residents and was chartered in 1911. Rich in history, Chesnee SC has plenty to do including HomeSpun Bluegrass, a live acoustic music show that takes place twice a month. For the family historian, there are a few sites to visit including Cowpens National Battlefield as well as the Zeno Hicks house. If you're visiting, you might as well check out the homes for sale in Chesnee. Conveniently located north of I-85 at the intersection of Highways 11 and 221, Chesnee is an easy stop if you are heading to the beach or the mountains. We would love to have you stop by and visit our local shops. Or grab a tasty snack at one of our local restaurants. You will love the laid-back feel of Chesnee, and we look forward to meeting you. 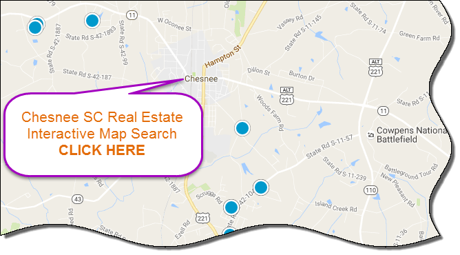 If you're looking to buy or sell a home in the Chesnee area, contact the PRODUCER Realty expert real estate team at 864-438-5050.